In the fall of 2013, Theatre Direct Canada partnered with The Chicago Children’s Theatre to bring Jacqui Russell and production manager Dawn Akelis to Toronto with the aim of creating a workshop performance for children with ASD. The project was made possible through funding support from the Arts Education department of the Ontario Arts Council, an agency of the Government of Ontario. 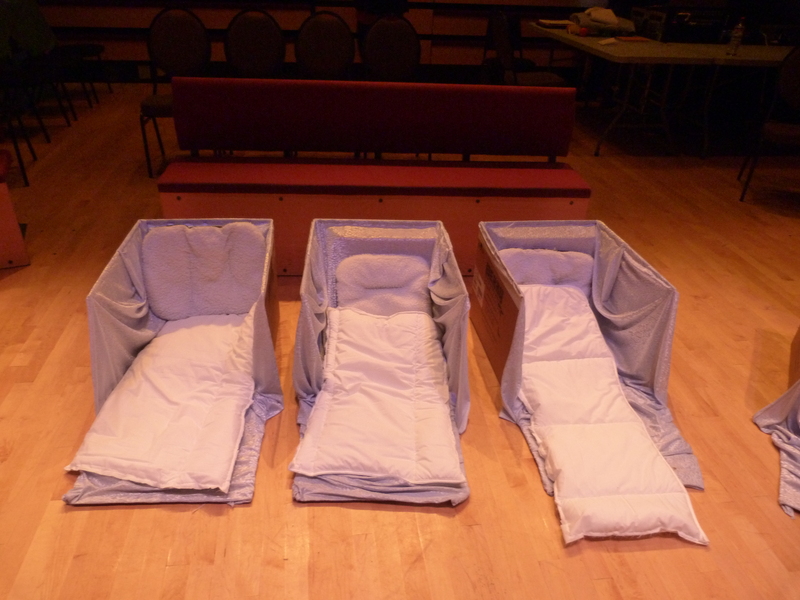 I was the project coordinator and dramaturg on project, and as such was able to help to create one of the most moving and important theatrical events I have ever experienced. Children with autism rarely have the opportunity to experience artwork that is created especially for them. Both Jacqui and Lynda Hill, Artistic Director of Theatre Direct, site Article 31 in United Nations Charter on the Rights of Children: “Children have the right to relax and play, and to join in a wide range of cultural, artistic and other recreational activities.” All children have these rights but there are few people creating artistic activities for children with ASD. Our goal was to bring Jacqui and Dawn from Chicago to train a group of Toronto artists in the methodology behind creating a Red Kite play. A complex and multifaceted disorder, autism presents differently in each person who is on the spectrum. “If you’ve met one child with autism, you’ve met one child with autism” as the saying goes. One generalization that can be made is that children with ASD usually respond to sensory experiences. Because of this, Red Kite projects are built of sensory events, with little dialogue or narrative story. In the weeks leading up to Jacqui and Dawn’s arrival, our designer Andy Miller worked busily collecting materials to respond to Jacqui’s artistic vision. Jacqui wanted to explore a theme suggested by the children’s book “This is Not a Box”, by Antoinette Portis. Emails flew back and forth between Andy and Jacqui. How can boxes be a starting point for the imagination? What could be in the boxes? What could they become? Andy didn’t need to come up with a set so much as she needed to think creatively about what possibilities boxes offer. Because this piece was to be based on sensory experiences, the designer’s role became primary. Andy’s sensibilities immediately gravitated toward textures and tactile responses. There would be only 4 performances, so she didn’t have to worry about the longevity of supplies. She could create things from cardboard boxes, knowing that they only had to last for a brief time. But she also was going to have to work fast. It was to be a week of intense collaboration, a quickly devised piece in which every member of the creative team was involved. Andy would create the physical presence of the piece as ideas were generated. This gave an incredible vibrancy and immediacy to the project. A cast of four actors was assembled, chosen for their physicality, musical abilities and honest playfulness. From their perspective, they were going to be building a show with no script and few words. There were no characters – each actor was addressed by name and brought his or her personality into the world they created. They were themselves, singing, moving, guiding, communicating. We had five days to create a unique piece of theatre for a group of children who manifested a wide spectrum of ASD behaviours. When Jacqui and Dawn arrived at Theatre Direct they immediately engendered an open and generous environment, one in which everyone was encouraged to contribute. Few on the team had any previous experience with autism, however, so the first day was spent in trying to learn about our audience. Beverley School is a Toronto public school dedicated to supporting the needs of children with developmental and/or physical disabilities. Working with teacher Linda McLaverty, we arranged for the creative team to go to meet some of their children with ASD. At Beverley, Jacqui led the children through a drama class. The project became specific. We now knew who we were designing the piece for. They were individuals and we and busily learned their names, their likes, their dislikes. Back in the rehearsal hall, Jacqui began to flesh out a framework for the show. The boxes became packing boxes. The premise: a family has just moved into a new house and the children in the family are having a hard time going to sleep – they want to keep exploring the boxes and find treasures. 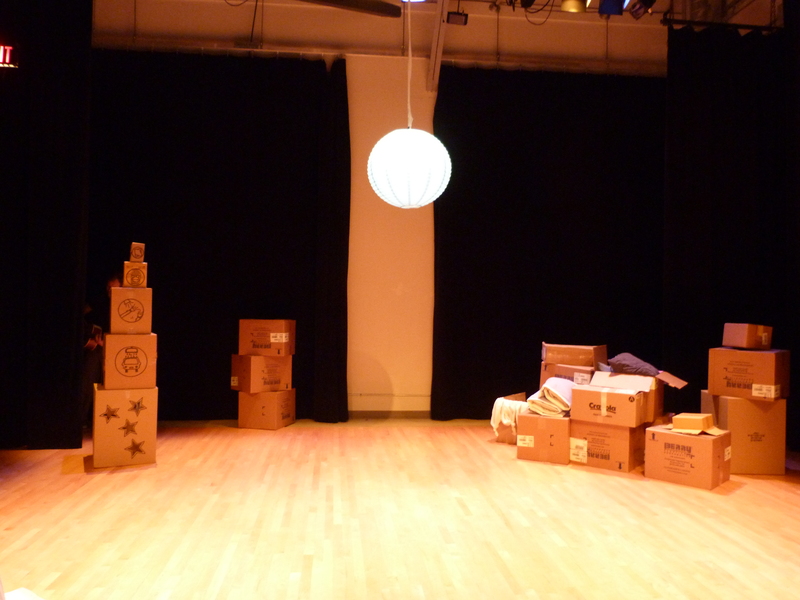 Cardboard boxes formed the set, and held treasures to discover. A series of sensory events were developed, each bracketed by “Papa Tim” trying to get the children to sleep. A pillow fight, dance party, flashlights in a tent, a car wash – all created with textures, sounds, lights. The culmination was a lullaby, when the whole theatre space filled with stars – points of light gentle moving outward. It was a calm, dream-state event that filled everyone with wonder. Red Kite, Brown Box began to take shape. 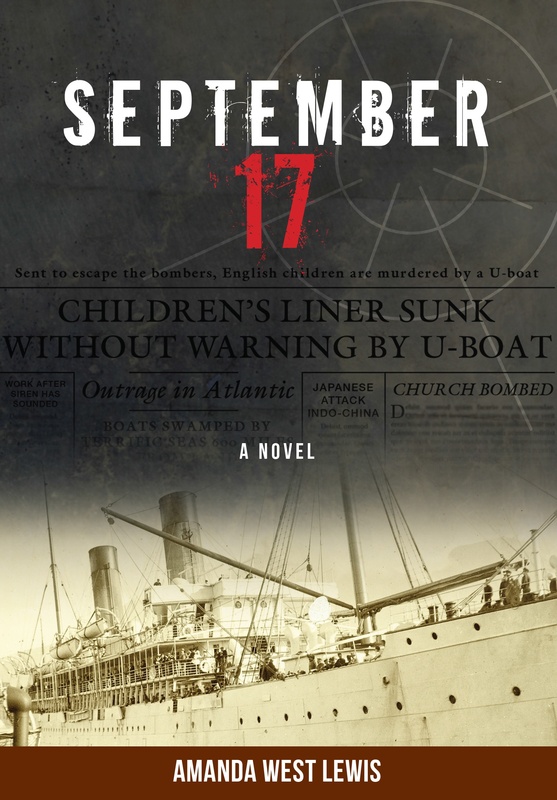 “September 17: A novel” has just been published by Red Deer Press. 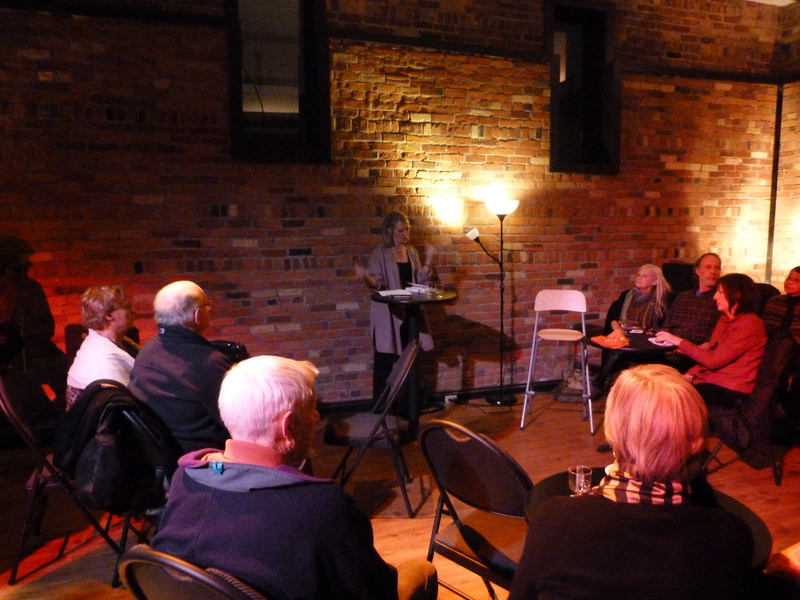 It’s my first novel, and I’ve had been doing launches and readings in Toronto, Kingston and Ottawa. The book is based on true events. I came across the story when I was at an exhibit called The Children’s War in the Imperial War Museum in London, during the fall of 2011. In the exhibit, I saw a photo from 1940 of a group of young boys, about 10 years old, with huge grins on their faces. They were wearing oversized sailor’s hats and waving from the deck of a ship. 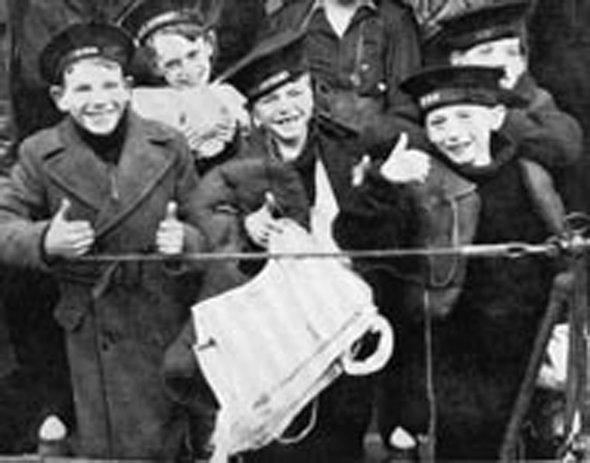 I think the caption might have read “Children Back from the Dead.” It went on to explain that the boys had been in a lifeboat for 8 days, after their evacuation ship, the SS City of Benares, was torpedoed by a German U-boat in the middle of the Atlantic. I looked again at their faces, at their smiles. I was hooked. I started to read everything I could about these boys and the terrible fate of the SS City of Benares. I spent many happy hours in the archives of the Imperial War Museum, where there are audiotapes of some of these boys and other survivors. As I listened to their accounts, and as I learned more about the 100 children who were aboard the City of Benares, I knew I needed to tell their story. More than that, I wanted to get as close to them as I could so that I could tell the story from their point of view. In March of 2012, Tim and I stayed in Salcombe, Devon. We found a perfect cottage by the sea and spent a blissful month writing, walking and immersing ourselves in town life. The photo at the top of this blog site shows the view from my writing desk. It was at that desk that I began the first draft of the book. If you look at the picture closely, you’ll see the book on the desk is “Miracles on the Water” a great resource book about the City of Benares by Tom Nagorski. Writing the book is a tangible result of Stepping off the Treadmill. The book happened because I had stepped out of my regular life. I was somewhere else, open to new ideas, new people, new possibilities. It happened because I had the time to be curious, to do research and to fall in love with a group of children. Now, I am able to share the story. I have been reading segments of the book aloud, and every reading reconnects me with the children. I’m reminded of their bravery, their humour, and their strength. But of course I can’t help but be aware of the enormity of the tragedy, and the loss of so many young lives. An amazing coincidence happened when I went to Kingston with the book. John Lazarus, one of Canada’s foremost playwrights, came to the launch. He was excited that I had written a book about this almost forgotten piece of history. His uncle, who he is named after, was the deputy radio officer on the City of Benares. His uncle John went down with the ship as he tried to radio for help for the children.